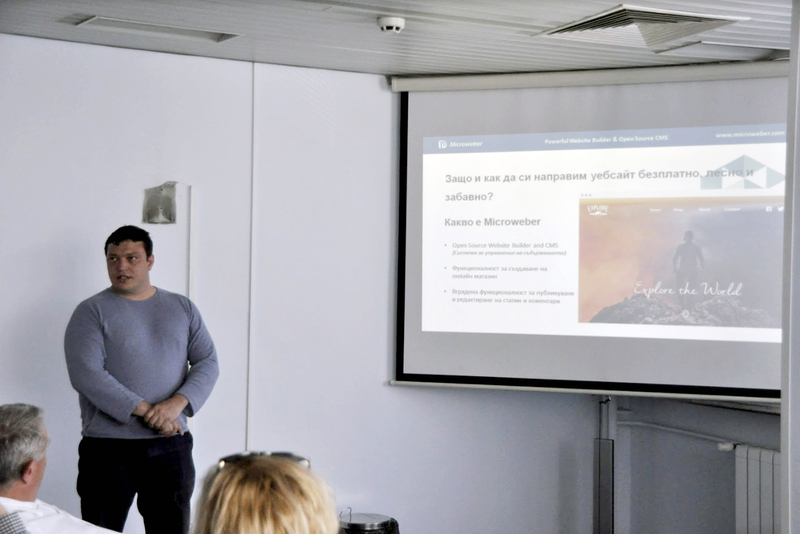 Microweber CMS & Website Builder took part on Wednesday (April 25th) in a roundtable dedicated to Bulgaria's latest innovation projects in Sofia. The event was organized by the Innovation Council at the Bulgarian Chamber of Commerce and Industry (BCCI). Some of Bulgaria's leading experts in innovative science and technology were introduced to Microweber's functionalities and the benefits they could bring to their work. "Amid the increasing penetration of internet, having a website is a must for every aspect of live, including science. With Microweber, you can build your website with minimum resources in a matter of hours," said Microweber founder Boris Sokolov in his presentation titled "Free Drag & Drop Website Building and Online Store with Microweber". "Forget about expensive web design companies and long development processes – with Microweber, anyone can secure their online presence and let the world know what they are up to. The benefits are immense – not only do you get publicity, but you are also opening up to potential partners, sponsors and fellow experts and scientists that you can collaborate with on your projects," he added. Sokolov introduced the elite audience to Microweber's main functionalities, including module architecture, templates, marketplace, Live Edit, admin-panel, etc. He took them through the easy process of setting up a website and noted Microweber's achievements, including its ranking as one of Europe's Top 100 and Bulgaria's Top 10 startups (according to startupranking), a Forbes Bulgaria nomination and second place ranking in the Software Development category in 2017, etc. The startup behind Microweber was founded by Peter Ivanov, Alexander Raykov and Boris Sokolov in Sofia, Bulgaria, in 2015. What they created is a new generation CMS and website builder, giving users a real Drag & Drop experience in an open-source environment. Unlike many of its peer CMSs and website building tools, all Microweber templates come with a built-in online store functionality. The system has 40,000+ active users worldwide.